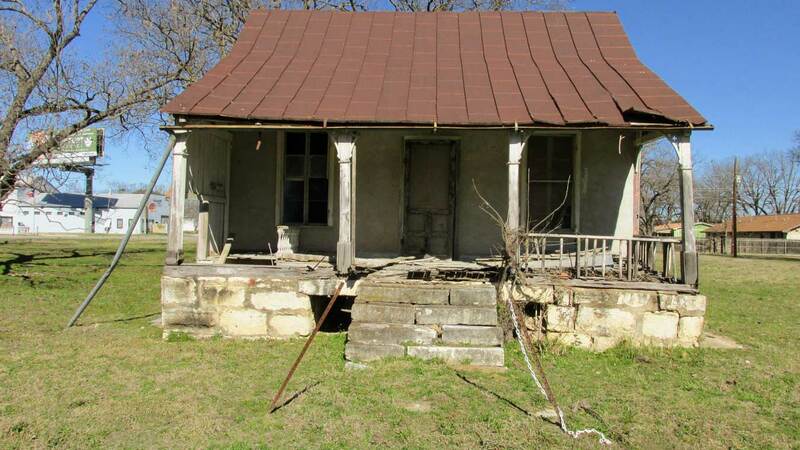 Could this be the oldest surviving Kerr County Courthouse? This past weekend I traveled to Comfort, hoping to solve a mystery. Several friends there told me a building once used as Kerr County's second courthouse was still standing, though in bad repair. If I could pull together enough evidence, it would be a great historic find, and provide a trick question for local historians. Question: Where is the oldest courthouse in Kerr County? Answer: Not in Kerr County. Question: What? Was the building moved? Answer: No. The county moved. Local tradition in Comfort says an old house at 424 Main Street, facing the park, once served as Kerr County's courthouse. I'm told the old house was once the home of William and Caroline Heuermann; in 1860, according to the census, they were a young couple with two toddlers. 1860 was a year of political upheaval in Kerr County. In March, 1860, by a vote of 78 to 21, some Kerr County voters chose to move the county offices to Comfort. On May 21, 1860, the commissioners court met in Comfort and accepted a gift from Ernst Atlgelt of about 10 acres of land for use as a public square. Incidentally, William Heuermann was a commissioner on the Kerr County commissioners court, and was part of the court which accepted the land for the public square. At that meeting, the commissioners considered building a new courthouse for Kerr County. "The matter to build a Court House was before the Court and after a fair consideration it is agreed to that a Court House be built in Comfort on the Public Square." A contract for building the courthouse was granted at the same meeting to V. Pfeuffer, to be completed within 9 months, according to "A Hundred Years of Comfort in Texas" by Guido E. Ransleben. The total cost of the building would be $500. Until a courthouse was built, commissioners met in a building owned by Christoph Humboldt on Lot 264 in Comfort. A bill for rent due was presented to the court for seven month's rent, from December 1, 1860 until July 1, 1861. The lease was renewed for an additional six months, until the end of 1861. There is no mention in the July, 1861 session of the commissioners court of the courthouse building V. Pfeuffer was to have built in nine months, which should have been completed in February or March of 1861. Since Comfort was only briefly the county seat of Kerr County, from 1860 until 1862, no permanent courthouse may ever have been built. Several friends in Comfort remember their parents telling them the Heuermann house was the courthouse; most remembered the added tidbit about the basement serving as the jail. So last Saturday I went to see the house for myself. What I saw was a very old building in need of some tender loving care. Here and there the stone foundation had cracks or had crumbled; the metal roof had peeled back in some places, exposing the frame to rain and damage. Several of the windows were gone. The building, however, did not look to be beyond repair. Despite its age, it has retained a lot of its original grace. But was I looking at the oldest surviving courthouse in Kerr County? That was the mystery. There is a gap in the timeline of the Kerr County courthouse in Comfort. The commissioners met in Comfort in late May, 1860. They ordered the building of a courthouse, to be completed in nine months. While waiting for the courthouse to be built, the court met in a building owned by Christoph Humbolt, with a lease starting in December 1860. The timeline gap, then, is from late May, 1860 until they started renting Humbolt's place in December, 1860, a gap of about six months. Is it possible the commissioners court met in the home of one of its commissioners, Heuermann? 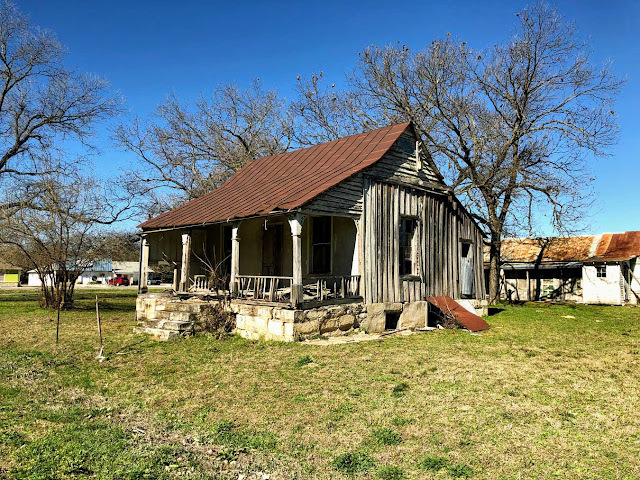 Is there a kernel of truth in the old stories about the house on Comfort's Main Street having once served as the Kerr County courthouse? It's certainly possible. The log courthouse built in Kerrville in 1856 was tiny and only had one door and one window. The Heuermann house on Main Street in Comfort would have been a definite improvement. Joe Herring Jr. is a Kerrville native who is thankful for the help of so many folks in Comfort, including the fine folks at the Comfort Heritage Foundation. This column originally appeared in the Kerrville Daily Times January 26, 2019. 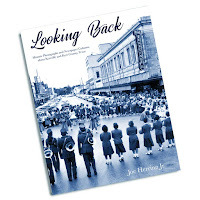 Do you have a copy of my third book, which has historical photographs and collected Kerr County history columns? You can get more information by clicking HERE.